We’ve been working with the Pasadena Roof Orchestra for a while now, designing and printing posters and publicity material for their concerts around the UK.These 6-sheet posters – measuring 1200x1800mm – for a one-off concert in Cadogan Hall. 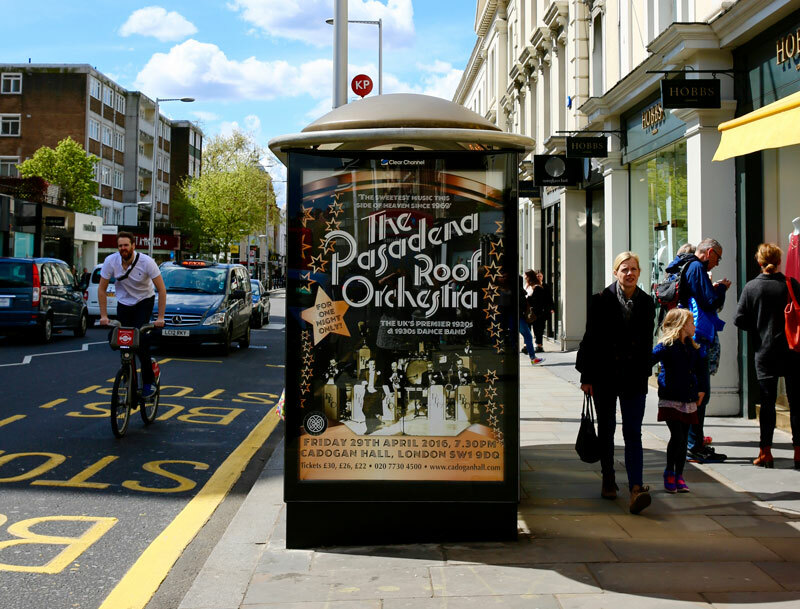 just off Sloane Square in London, were the largest posters we’ve produced for the Orchestra so far. Made from an original Press Gang design to Clear Channel’s Adshel specifications, the posters are shown here on a bus stop in the Old Brompton Road – a prime location outside a rather well-known restaurant. Using the Orchestra’s existing logo, we came up with an art-deco-style design that emphasised its repertoire of classics from the 1920s and 1930s. The PRO – which marks its 50th anniversary in a couple of years – also distributed some Press Gang-designed leaflets at the concert, promoting a weekend of music and dancing in the luxurious surroundings of the Grand Hotel, Eastbourne, later this year. If your band or event is in need of some posters, get in touch. We can supply posters up to A1 size, with flyers from A7. Sadly, we can’t promise that they’ll be seen in such a prominent position! Journalist, designer, print buyer and web designer – David started The Press Gang in 1991. Besides communing with Macs, he likes sailing, travelling, singing shanties, Spotify and keeping the customer satisfied.